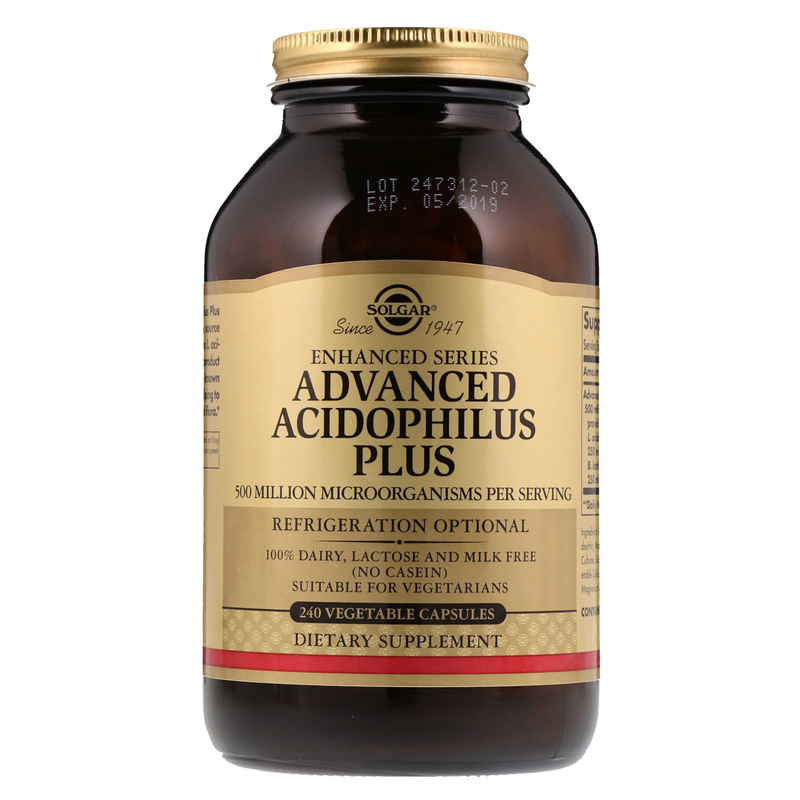 Solgar's Advanced Acidophilus Plus Vegetable Capsules are a source of beneficial microorganisms L. acidophilus and B. lactis. 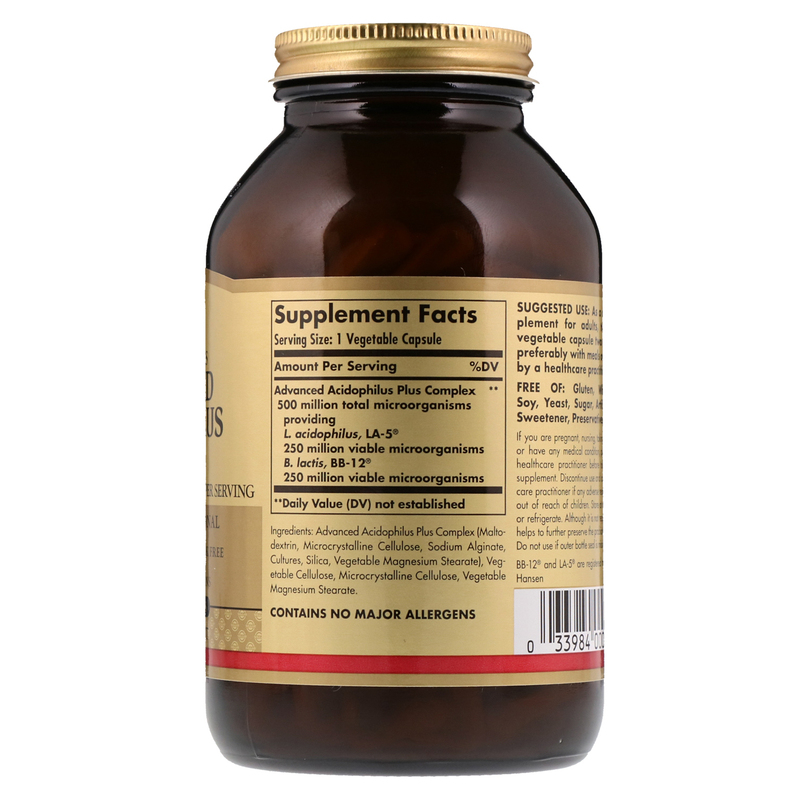 This product is formulated with well-known strains LA-5 and BB-12, helping to maintain a healthy intestinal flora. As a dietary supplement for adults, take one (1) vegetable capsules two times daily, preferably with meals or as directed by a healthcare practitioner. Advanced Acidophilus Plus Complex (maltodextrin, microcrystalline cellulose, sodium alginate, cultures, silica, vegetable magnesium stearate), vegetable cellulose, microcrystalline cellulose, vegetable magnesium stearate. If you are pregnant, nursing, taking any medication or have any medical condition, please consult your healthcare practitioner before taking any dietary supplement. Discontinue use and consult your healthcare practitioner if any adverse reactions occur. Keep out of reach of children. Store at room temperature or refrigerate. Although it is not required, refrigeration helps to further preserve the probiotic microorganisms. Do not use if outer bottle seal is missing or damaged.